We, the representatives of social and popular organizations of Peru, Latin America and the Caribbean, met in Lima, Peru from April 10 to 14, 2018 to discuss the political, social and economic reality of Our America, to share our struggles and resistances, to strengthen the militant solidarity of our people and to strengthen the continental unity of the social and people’s movements of our region. Union organizations that fight for the defense of the labour rights of the working class, trade associations, feminist organizations that fight for gender equality, youth and student organizations that defend the rights of youth as leading actors, peasant organizations that continue to fight for the right to land, indigenous organizations that resist the onslaught of savage capitalism, environmental organizations that confront the predatory extractive model, organizations that defend the rights of sexual diversity, community organizations that fight for the rights of the citizenship, regional platforms that confront neoliberal free trade projects, organizations that fight for tax justice, regional networks of civil society organizations and dozens of collectives and movements that struggle day to day against political power and economic capital in its different expressions met once again. And once again, we find ourselves in a scenario of confrontation and head-on struggle between the neoconservative forces of the submissive elites and the social, popular, progressive and leftist forces in Our America. We are living a counter-offensive of a imperial power that tries to erase the democratic advances and those of social and political inclusion that progressive governments have promoted in this last decade and a half. In Peru, the expressions of these neoconservative forces which are trying to regain hegemony met in the VIII Summit of the Americas, an illegitimate summit that is not the expression of Latin American and Caribbean people. They came to talk about governance and corruption in Peru, where all of the presidents of the past 30 years still have open cases for crimes committed whilst in power. They want to continue with their corrupt policies by promoting the Public-Private Partnerships to continue their dark negotiations. In this scenario, the people’s organizations of Peru, united in the National and Unitary Command of Struggle (CNUL) and the General Confederation of Workers of Peru (CGTP) called on the social and people’s movements of Our America to come together in the People’s Summit, in order to advance in the social coordination that confronts the neoliberal model in the continent. – We renew our call to face the onslaught against the working conditions and rights of the working class in the continent. We reject the neoliberal policies that promote precarization and labor deregulation, we demand decent and dignified work. – We oppose neoliberal austerity measures aimed at reducing public investment in social welfare protection programs. – We reject the calls to privatize public retirement schemes to deliver the resources of millions of workers to private corporate interests. – We continue to reject the Free Trade Agreements and the Investment Protection Treaties, which are instruments in favour of transnational corporate power and against our peoples. – The right to land is today more than ever the inalienable right of our native peoples and peasants, the land must be for those who work it. – We condemn macho violence and the systematic impunity regarding femicides that dangerously become a widespread practice in our continent. In our agenda, we prioritize the struggle for gender equality. Without equality of salaries for women, without parity in political participation, without equal access to decent jobs, without respect for their sexual and reproductive rights, we won’t have societies that are equal, democratic or inclusive. – We condemn the criminalization of social protest that has become a regular occurrence in our countries, affecting numerous social activists. – We continue to fight the extractive economic model and for the modification of the productive matrix of our countries. – We call on people to confront the strengthening of religious fundamentalism that, in alliance with capital, aims to regress Our America. – We reject the use of justice systems as instruments of political persecution against progressive leaders in Latin America. We express our unwavering solidarity with fellow President Luiz Inácio Lula da Silva, who today faces the whole apparatus of the politicized criminalization and the hatred of Brazilian elites for being the leader of the oppressed and excluded. We reaffirm our unwavering solidarity with the people of Martí, Che, Fidel, Raúl, the heroic Cuban people and their glorious revolution. The Cuban revolution continues to be, in spite of the aggression and the difficulties, the best example of dignity, which makes it an example to follow. We demand therefore the end of the criminal economic, financial and commercial blockade of the United States against Cuba as it was strongly demanded by the General Assembly of the United Nations, as well as the immediate return of the illegally occupied territory by the US military base in Guantanamo. We reaffirm our unwavering solidarity with the Bolivarian Revolution of Venezuela. We strongly condemn imperialist aggression, economic war and political harassment against Bolivarian Venezuela. We demand respect for the sovereignty of the Venezuelan people’s homeland, who, since 1999, initiated a constituent process from the people that marked the path of anti-imperialist struggle for Latin American unity and for Our American socialism. We support President Nicolás Maduro, successor of the historic project promoted by Commander Chávez, while we demand the cessation of illegitimate and unilateral sanctions against the Bolivarian people. We reject the intent of military intervention in Venezuela under the pretext of humanitarian aid; we demand non-interference in the upcoming elections of May 20 and respect for the sovereignty and self-determination of our peoples. We reaffirm our solidarity with the Bolivian revolutionary process led by our comrade Evo Morales. We reaffirm our support for the historic claim of the Bolivian people, for a sovereign exit to the Pacific Ocean. We demand the peoples of Chile and Bolivia to urge their governments to reach a peaceful resolution through dialogue. #SeaAccessForBolivia. The Citizen Revolution led by comrade Rafael Correa showed the world that progressive processes can make transformations that put the human being above capital; showed that the redistribution of wealth, the defense of sovereignty and the respect and protection of human rights are fundamental to achieve the society of good living. From the Summit of the Peoples, we expressed our concern about any regression in the achievements made in Ecuador and, above all, any restoration of neoliberal positions linked to the interference of the State Department of the United States. We reject the racist and xenophobic policies of Donald Trump towards our brothers and sisters in Mexico, who in addition to suffering from their corrupt political elite and the consequences of neoliberalism, repression and corruption, must deal with the construction of a WALL against them. We oppose the criminalization of migration, migration is a right. Haiti was the first shout of freedom and independence in Our America. MINUSTAH has left hundreds of victims with diseases, rapes, murders. We ask for the historical compensation for the damages of this occupation and we denounce its new mask that bears the name of MINUJUST. We greet and send a fraternal hug to comrade Oscar López Rivera, who has won his freedom with coherence and dignity. But with this victory the fight is not over, we will continue in the anticolonial battle for a Free Puerto Rico! We are still asking for justice for Berta Cáceres, we condemn the brazen electoral fraud of 2018 that kept José Orlando Hernández in power. We send our solidarity to the hundreds of thousands of Hondurans who have demonstrated and continue to resist the repression of the dictatorship. We demand from the Colombian government the real implementation of the Havana peace accords, the continuation of the negotiation process with the ELN and the immediate freedom of peace negotiator Jesús Santrich, of prisoner Simón Trinidad in the United States (14 years in jail), and of the thousands of political prisoners still in Colombian jails. We also denounce the murder of more than 300 social leaders in the last two years, and we urge the government to protect their lives. Our solidarity towards the Argentine people who today resist the onslaught of the neoliberal policies of Mauricio Macri. We do not forget Santiago Maldonado, disappeared and murdered in 2017, and Rafael Nahuel, the children massacred by the police. We demand the freedom of Milagro Sala and all those persecuted by the judiciary-media powers. From the People’s Summit we condemn the military aggression of US imperialism against the Syrian people, we call to promote actions of condemnation in the US embassies for this murderous action. All our solidarity with the comrade people of Syria. Our solidarity with the struggle of the Mapuche people for the recognition of their rights. We stand in solidarity with the Palestinian people who are constantly being besieged and massacred at the hands of imperialist Zionism. We sympathize and support the legitimate cause of the Saharawi people and their right to self-determination. From the People’s Summit we call on people to come to Buenos Aires, Argentina in the actions against the global imperial power that will be gathered in the framework of the G20 summit on November 30 and December 1. With special interest we call to participate in the Feminist Forum against the G20. In order to continue with the process of debates that we have held here in Lima with the urgent need to promote the continental re-coordination of the social movements. 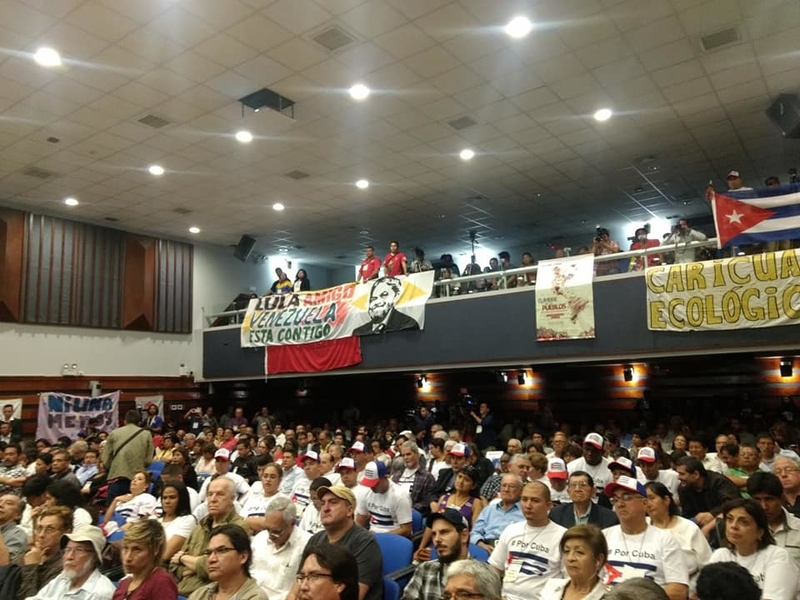 We ratify here in Lima, Peru, that the People’s Summit is the space in which we find ourselves to reaffirm our solidarity, to exchange our experiences of resistance, to articulate our agendas of struggle and to strengthen the unity and articulation of the progressive social, popular and leftist movements of our America. Long live the struggle of our people! Long live the People’s Summit ! !